The Oksana polished nickel 5 light chandelier with crystal drops and black shades, an opulent chandelier, with large faceted crystal droplets adding a touch of glamour. 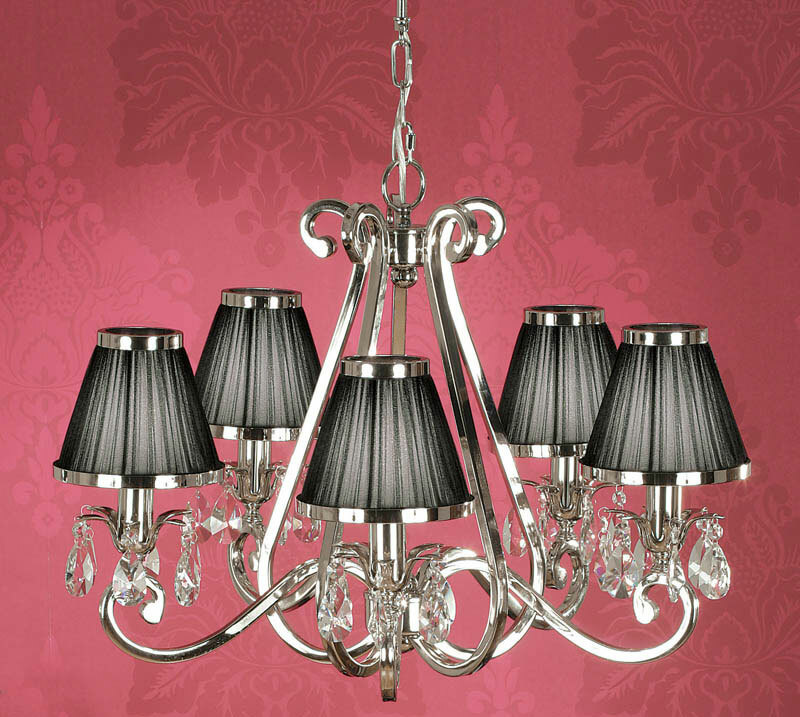 A magnificent polished nickel 5 light chandelier with scroll arms and masses of quality 24% lead crystal drops. Featuring a central caged frame, double curved lamp arms, decorative petal sconces and candle tubes. Each sconce is decorated with large faceted crystal drops that sparkle when illuminated. 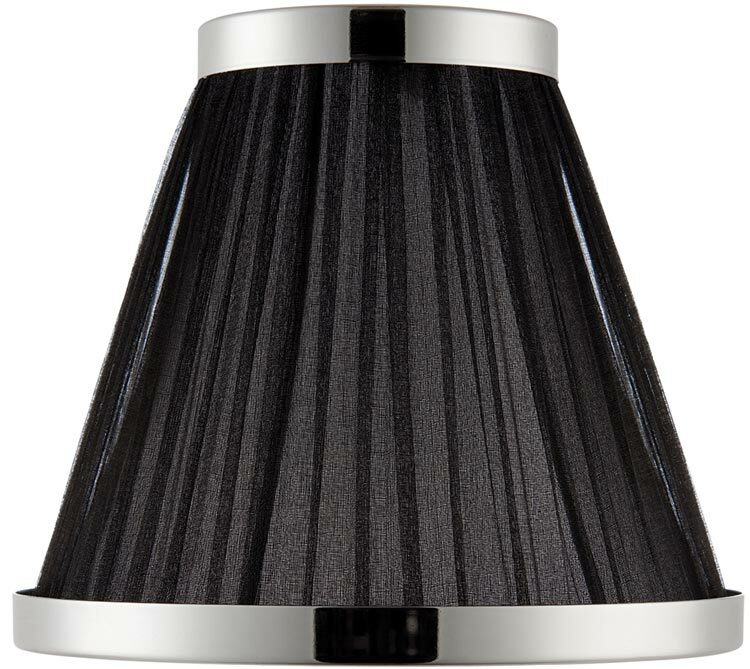 Supplied with wonderful 6-inch black faux silk pleated shades that feature a polished nickel trim at the top and base. 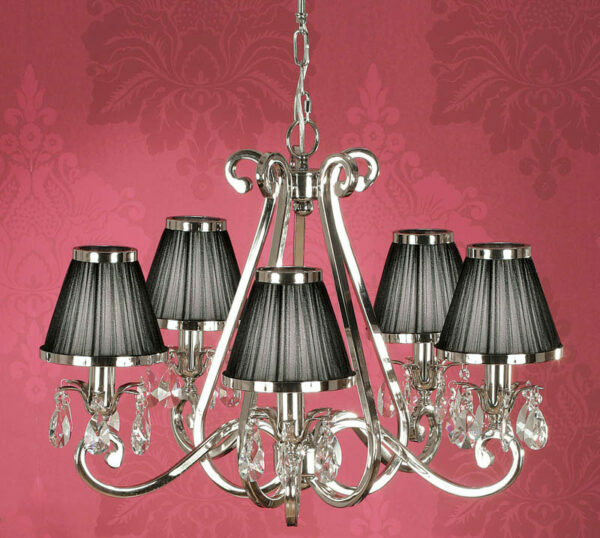 This is a medium sized chandelier suitable for any medium to large room, hallway or landing. Perfect for living rooms, dining rooms and bedrooms too. Height adjustable at the time of installation, minimum height 59cm, maximum drop 149cm. The Oksana polished nickel 5 light chandelier with crystal drops and black shades, part of the New Classics collection, an interiors 1900 exclusive design that has previously won the lighting show best product award.